In the era of digital revolution all over the world, the threats are increased with the number of users connecting to the internet. In such cases, using the same password for all of the online services is very risky. If any of the services gets compromised, then you may face issues with all of the services, as if the password is breached, no one can stop the hacker from accessing the services using the same password. That’s why you should use any of the best password managers for Android application. With the Password manager, you can keep the record of all of the passwords used on various websites and services. As you have the application which keeps all your passwords at the same place, you can start using multiple passwords on multiple websites without any need of remembering the same. With the password manager apps for Android, you’ll eliminate the risks of getting compromised on multiple websites and services at once due to the same password. In this post, I will share the list of some of the best Android password manager apps, that you can install and forget about remembering the passwords. These apps will help you save the password, autofill username/password, and create strong passwords with a single tap. 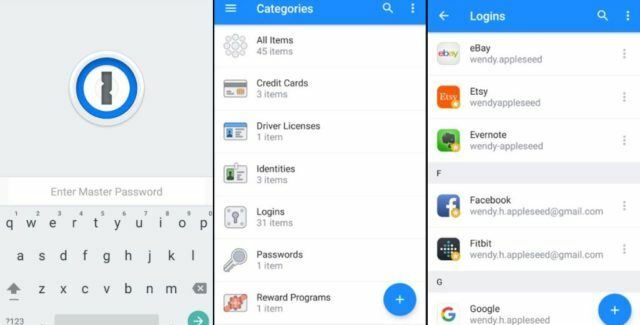 Here is the list of all of the best Android password manager apps 2019, which you should consider installing in your smartphone. What are the Password Manager Apps? The password manager apps for android are the applications, which securely save all your passwords. As you use many apps and online services which need username and password, it is not possible to remember the combination of username/password for all of the services. 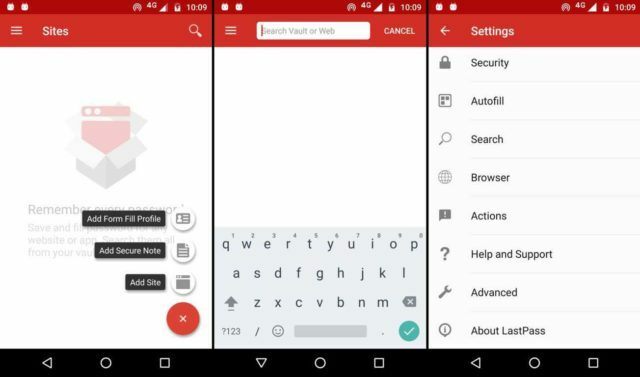 But with the Android password manager, you can eliminate the need and quickly suggests the saved password while you are trying to log in. Dashlane is one of the most popular password manager apps for Android. With Dashlane, you can access tons of features and keep your passwords safe in a vault. Dashlane is a cross-platform software, which means it will run on your PC, Mac, iOS and Android devices. So, the password saved on one device will be accessible from all others. All of the passwords that you save are stored in the AES-256 encryption, which means they are unbreakable unless you have the master password. The hackers cannot get their hands on the stored password as the security of this app is top-notch. With the Digital Wallet feature, you can save the passwords for your Internet Banking account, Financial accounts, Debit cards, Credit Cards, third-party wallets, cryptocurrency and many more services. Dashlane is free to download an app with no advertisements to annoy you. Also, it comes with the premium version, which offers more features than the free version and integration with cross-platform installations. LastPass is one of the most popular cross-platform password managers, that is used mostly by the Windows and Mac users. But, the company has launched the Android application of the same, which allows the users to access all of the features they get on the computers. With the advanced AES-256 Encryption, the users should not worry about the safety of the stored passwords. The Autofill feature is one of the greatest features as it will automatically fill the login-forms for you. It supports the two-factor authentication sites and fills the One Time password in the appropriate field automatically. Also, you can generate a secure password that is very hard to break for hackers with the help of this app. With access for all of the users from Windows, Mac, iOS and Android, the subscription plan works in all of the versions. You can sync all of the data from one device to another seamlessly and without any hassle. It is a premium application that comes with affordable subscription plans. You may’ve not heard the name SafeInCloud, but it is one of the best password managers for Android. 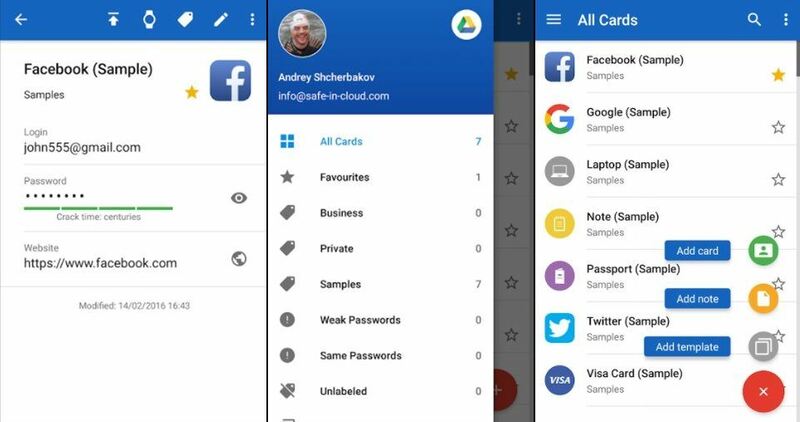 With the SafeInCloud password Manager for Android, you can save all your passwords and username combinations safe in cloud services. You can use any of your favourite cloud storage services to store and sync all of the passwords at the safe place. The SafeInCloud app is available on the Windows and Mac Computers, so you can synchronise all your passwords from the computer to the cloud and access them later from the application. With the powerful password generator with the AES encryption system, the app generates the passwords that are safer than any of the password manager apps for Android. The app is free to download from the Google Play Store and has some premium subscription plans that give you access to additional features. Almost everyone has used the 1Password Manager app on the computers. The 1Password Manager app is one of the feature=packed apps for Android. With this application, you can securely save the passwords without the fear of exposing them. Without the master password, no one can access the list of all of the passwords that you’ve saved. From every detail of your online services like Social Media, Debit cards, Credit cards, online banking, financial services, Notes and many other things are saved safely. As the new devices do come with the fingerprint sensors, the app supports the same. It supports Fingerprint as the password for using as the Master password and also associates appropriate login details from the tap of your fingerprint. You can access all these features by subscribing to the subscription plan or take a 30-Day free trial to assess the features for free. 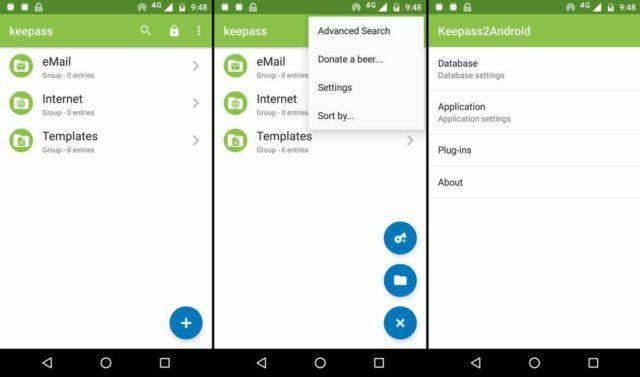 Keepass2Android is the modified and port version of the popular password manager app for Windows. It reads and writes in the .kdbx format, which stores the passwords in secure ways. Being one of the popular apps for Windows ported to Android, it comes with similar functionality. With the Quick unlock of the apps with a master password and also the deep integration with any web browser, the users will never get any issues in selecting the right password for the service. Another interesting feature in this app is the Soft-keyboard. The keyboard keeps your passwords safe from the clipboard apps. So, you won’t accidentally save your passwords and username combination in the clipboard. Unlike any other Android password manager app, it does not consume too much power resources and works well in Battery Saver mode. 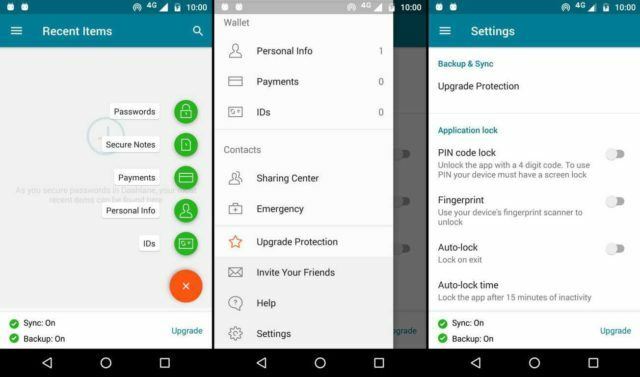 In this world full of online threats from hackers and attackers, you should always stay safe by installing Android Password Manager. We tried our best and listed some of the best Android password manager apps 2019. All you have to do is to choose the best one and install it in your device to keep all your passwords at one place and access them anytime you want.